Every year on 25 March, on the International Day of Remembrance for the Victims of Slavery, we get opportunity to honour and remember those who suffered and died at the hands of the brutal slavery system. For over 400 years, more than 15 million men, women and children were victims of this tragic practice. 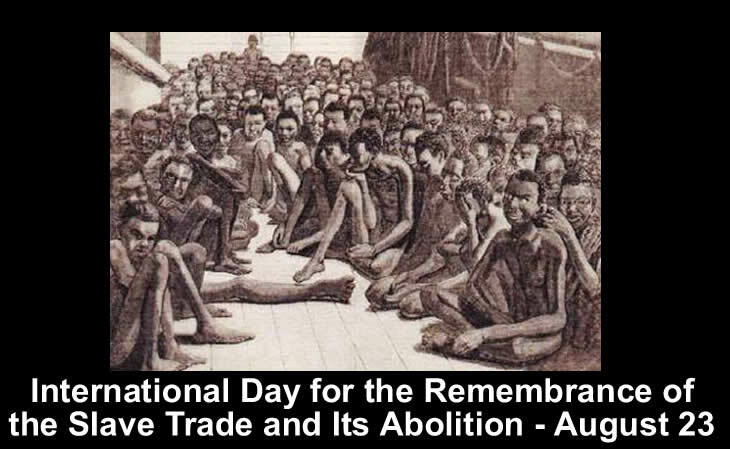 August 23 of each year, has been designated by UNESCO to memorialize the 'transatlantic slave trade' which took place across the Atlantic Ocean from the 15th through 19th centuries. It is also is the day of observance for International Day for the Remembrance of the Slave Trade and its Abolition. August 23 is also a memorable day on Haitian calendar, because during the night of August 22 to August 23, 1791, on the island of Saint Domingue (now known as Haiti), an uprising began which later became a major factor in the abolition of the transatlantic slave trade.